Apple TV is one of the few products from the Cupertino company that doesn't feature either a touchscreen or touchpad, but that may change on June 8. At its Worldwide Developers Conference keynote, Apple is expected to announce a redesigned Apple TV and a new touchpad remote, reports The New York Times. The all-new remote is said to include the "touch pad" for the purpose of scrolling, but also keep its two physical buttons, according an unnamed employee briefed on the product. Apple TV's remote is likely to be thicker - which exactly no one will complain about. The current remote has an easily losable 5.8mm (0.2in) depth at its thickest point. It slips perfectly between two couch cushions. The new size is said to be comparable to an Amazon Echo remote, which, if you're unfamiliar with the new wireless speaker, is about the same dimensions as last year's Amazon Fire TV remote. Don't expect too much complexity from the new Apple TV remote, even with a touchscreen as part of its design and more content options than ever to go with it. 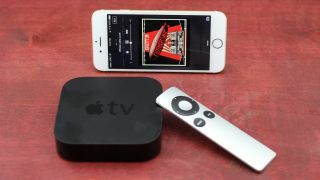 Apple is said to have used a Google TV remote, pre-dating the Nexus TV, to internally demo why 78 buttons is overly complex for users who simply want to relax on the couch and stream television apps. No word on whether the remote will incorporate long-rumored gaming controls or a feature in which you can find your always-lost Apple TV remote with the new iPhone or Apple Watch. Now that would be handy.